Our morning group activities are tailored to meet campers’ needs and encourage them to take risks and to accept new challenges. Above all they’re designed to be a lot of fun, challenging children to step outside of their comfort zones while enjoying a truly international atmosphere. Each group is required to participate in the activity together, building a closer bond and greater sense of teamwork amongst them. It’s important that the campers learn how to support others during the session, as not all will be on the same level. Tweens and Teens: Campers challenged on class 1 – 3 grade rapids with two to three per raft. A three hour paddle taimed at growing teamwork, communication, and having a lot of fun. Seperate Tween and Teen trips, never together. Juniors: Younger campers enjoy an introduction to rafting with a 2 hour raft down a fast flowing river with some basic grade 1 rapids. There are approximately six to eight campers per raft. Set in tree-tops of a nearbye forest, a two – three hour fun filled experience for all campers. There are 18 different stations, 2 ziplines, 2 different routes and a quick drop. Important to note that campers have to reach 140cm to be elible to participate. All Campers: A day trip away from the camp base where small groups of 7-8 enjoy cross-country riding through forests, fields, and rivers. An hour long trip plus horse and carriage ride. Individual Lessons: It’s possible to arrange individual lessons at an additional cost, however needs to be arranged before the camp starts. Deep in the forest a two to three hour team activity designed to build teamwork, communication, and decision making. All participants wear safety gear, while the whole activity is overseen by both activity staff and camp staff also. Seperate Tween and Teen trips, never together. A large variety of different tracks and difficulties ranging in length from two to six hours. During trips group always stops at nearbye river to enjoy the water. Also possible to take as an afternoon choice activity. An on-site activity which is a great introduction to the adrenaline side of camps for our young campers. Two zip lines, and a five metre drop in the Giant Swing. Exclusively for the Juniors in the morning, however it’s also an option for all campers in the Afternoon Choice activities. Whether it be feeding farm animals such as goats, sheep, cows; or learning how to make cheese; or discovering the tasks working on a farm. ; this off-site trip has it all. This region is known for many hidden caves, the younger campers will be hiking and exploring one of them. 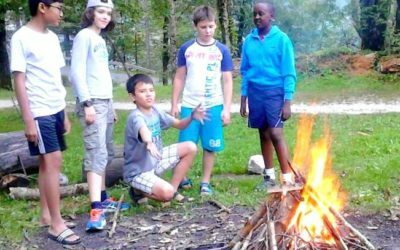 At Explorer Camps you choose how to fill your afternoons and evenings. With so many activities to pick from, you’re bound to find things you love to do as well as things you’ve never tried–or even heard of! Campers have the opportunity to choose activities together so that they stay with friends, however at all times they’re challenged to try something new and to step beyond their comfort zones. In the afternoon they have two choice activity sessions where they decide on what suits them best. Which exciting activity will you choose? ARCHERY - On-site with counselor experts ready to show those who are interested. TENNIS - Clay tennis court but make sure you bring the right shoes. POOL - On-site and available all day every day for all of our campers. PHOTOGRAPHY & MOVIE MAKING- Learn how to take good pictures or create a movie. POTTERY - Sculpting, making vases and cups. KAYAKING - 1km of calm and flat river in front of the campsite for campers to have fun in the kayaks. ORIENTEERING - Our camp surival expert Robert White is ready to teach our campers some important life skills. SURVIVAL SKILLS - Learn how to build a shelter, collect water, make a fire. SLIME MAKING - Popular pastime of campers. WATER GAMES - In the nearbye river. COOKING - Hot and cold meals. Ready to have some fun at Explorer Camps?